"Barack Obama", "Buffett Rule", "Republican governance"
The Buffett rule, as President Obama has said time and again, is about fairness. There is no reason why people who make more than $1 million a year should pay a lower marginal tax rate than the average middle class family. It's that simple. As we know, it isn't just President Obama and his socialist communist pinko hippie allies that think so. It would appear that Ronald Reagan, the Republican party's modern day Jesus, championed the principle himself. 60% of Americans support the Buffett Rule, including more than 2 in 5 Republicans. But as the Senate prepares to vote on the rule, most if not all Republican senators are poised to vote to block it. Why? The GOP will tell you that it would "raise taxes on small businesses" that file under the individual rates. Sure, if you consider hedge fund managers "small business" - but otherwise the claim is patently a lie. And the pundits in the media are busy telling everyone that it's just an election year gimmick since it won't pass Congress anyway. But of course, it wasn't last night that the President didn't start advocating for fairness in our tax code and for the wealthiest to pay their fair share. Frankly, I rather doubt that the White House is making the above Reagan video prominent to pressure Republicans - they could be doing it, rather, to give Republican members of Congress who agree with a very significant portion of Republican voters cover. The politics is not being played by the White House; the politics is being played by Republicans in Congress, who are afraid to give the President a "win" 7 months from the election. The wealth gap has grown over each of the last three decades, including in the one which we mostly spent under a Democratic president. And the second shows how the effective tax rates for millionaires has gone down even as their incomes have outpaced everyone else. 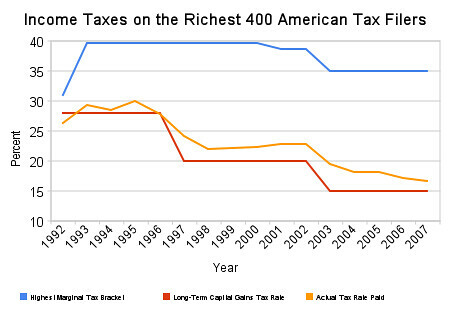 The issue of the wealth gap and the favorable tax treatment for the rich, it seems, is here to stay. This kind of wealth gap shouldn't simply bother anyone with a conscience, it is also bad for a consumer-based capitalist economy. We saw this during the economic collapse of 2008 as three consumer economic slumps coincided - massive job losses forcing people to pull back on spending, the credit crunch thanks to which consumers could no longer charge everything on a VISA, and the housing crisis in which homeowners could no longer take out home equity lines of credit to use it to buy consumer products. In something of a perfect storm, consumers stopped spending and the economy fell off a cliff. If the Republican economic argument was correct, and if requiring the rich to pay a lower and lower share of their income in taxes incentivized them to buy more things, one would assume that the 1% would pick up the consumer spending gap created by the rest of us. But they didn't. Nor, might I add, did they hire a ton of people to make things that people weren't buying. A truly free market economic system is incapable of producing a wealth gap that looks like this. The market - and tax policies - need to be rigged in favor of the wealthy for this to actually happen. It requires tax policies that favor concentration of wealth in few hands: through first and foremost preferential treatment of "capital gains", or money made from money, which is taxed at a far lower rate than comparable "earned" income (money made from work). But as the tax policies favor the rich this way, cuts are required from the basic investment in society: from education, from infrastructure, from services for the needy, the elderly and the poor, and from support systems for those hurt by economic downturns. So why would a common sense measure designed to make tax policies a little fairer from what has clearly not worked - where politicians with as widely varied visions of the country as Barack Obama and Ronald Reagan would seem to agree - be so politically charged? Why wouldn't this be a measure that both the President and the Congress can rally behind to give the American people a reason to re-examine their cynicism that the government can't get anything done? Why wouldn't the Republican party have a solution? Could it be that that cynicism - that government can't do anything right - is the foundation of conservative governance? Could it be that the GOP is more terrified by the statement made by the Buffett Rule than its budget effects? A successful passage of the Buffett Rule would say that in fact, government has a role and a responsibility to create greater opportunity for all and for investing in the common good. And once you have accepted the idea of the common good, the much broader conversation about tax fairness and the proper role of government moves in the progressive direction. It opens up the possibility for a much deeper values debate between a shared future and an on-your-own economy. The modern day GOP sees the very concept of common good as a social ill, a socialist plot to uproot America. The economic elite in the Republican party wants an economy where the wealth gap is even bigger, the services for the poor, needy, elderly, children and students are even more scant, and where the social compact is replaced with American aristocracies. The Buffett Rule threatens the fundamental reshaping of America that the political Right has been engaged in and invested in for decades. It is not a policy issue for them. It is a values issue. Their value of an economically segregated America is rebuffed by the Buffett Rule, and by other debates that would take root should the Buffett Rule succeed. Fairness is not a value for the political Right. In fact, economic fairness is contrary to their vision and values. And that is why they are terrified of the Buffett Rule. Apr 16 Screw Standing up for Moms, Let's Open Ann's "Early Birthday Present"